I am not the bread baker in our house that distinction goes to my husband, Trip. He started baking bread about 20 years ago as a way to alleviate stress after work. Pounding and kneading dough is great therapy... plus you get dinner out of it. 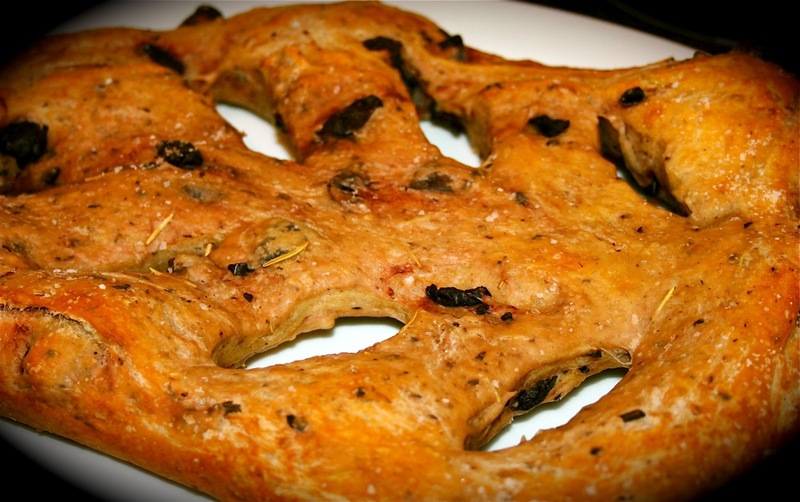 So, Trip took a go at Dorie’s Fougasse recipe and found it quite intriguing. 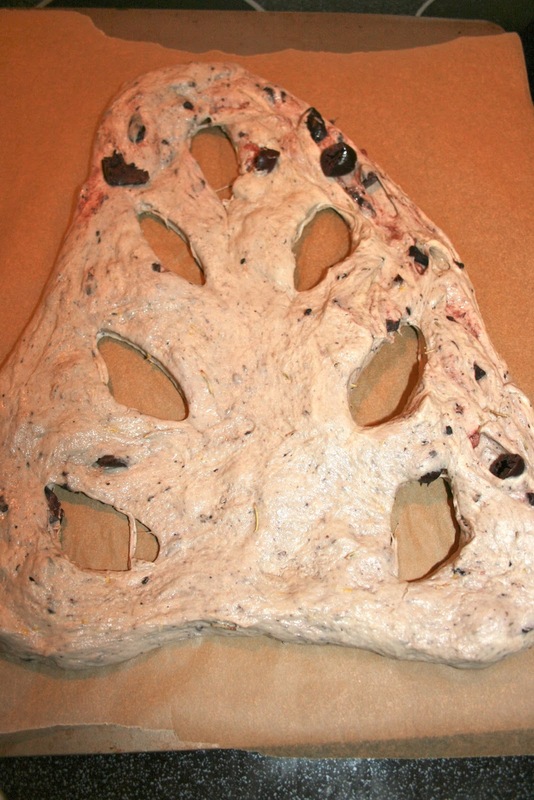 He has made olive loaves in the past and was a bit hesitant to put lemon zest into the dough. The result was very pleasing; the zest was a tart contrast to the brininess of the olives, though in the future the whole family agreed that he should use half the amount of zest Dorie recommended. The Fougasse turned out a little purplish. 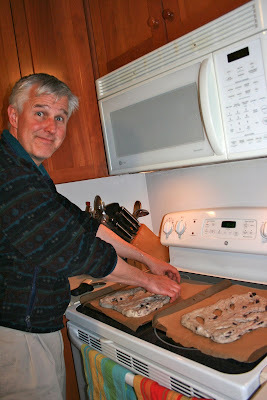 My husband remembered after the fact, that it is best to take the dough out of the mixer, flatten it out, and then evenly spread the olives across the dough, then roll the bread up into a ball. This way you gently press the olives into the dough which prevents the purplish juice from spreading through out the loaf. As far as Dorie’s tips Trip really liked the idea of using a pizza cutter to make the cuts into the loaf. He found this advice really helpful for shaping the bread. Because my husband is a serious bread maker we own a bread stone and keep bread flour on hand. We understand that this loaf is meant to be something that a person can throw together midweek for a nice appetizer, but the whole family felt that this bread did not have the crust or springiness of my husband’s usual loaves. Trip explained that a bread stone really helps give the bread more spring. He also usually puts a pan of water in the oven under the bread in order to add humidity. This method makes for airy irregular bubbles in the dough as it bakes. The structure of bread is so important to how satisfy it is to eat. When Trip makes this loaf again, which he definitely plans on doing, because we all really liked it’s flavor, he will incorporate his usual baking techinques along with replacing the all purpose flour with bread flour. The higher protein content of bread flour along with the bread stone and water pan all add to creating a bread that will be airier and chewier. 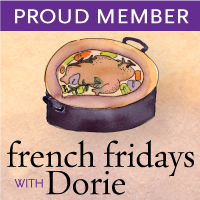 Overall, we can’t complain three hits with Dorie’s recipes. The Balchs are loving our weekly French dinner night. Truly tasty, with a little cheese and a glass of wine I would call this a meal. That is gorgeous. I miss Trip's awesome bagels!! He doesn't make those bagels often enough. Bagels for Mothers Day it will be. Diane, this turned out beautifully! I have this book but have not cooked much with it in a while. Have to try this recipe. Everything I have made so far has been incredibly tasting. You should definitely crack open the book and join our cooking group. Mine didn't really have the spring I'd hoped for either. I think it definitely needs some steam in the oven. So fun that your husband is a bread baker! With bread every simple thing can really make a difference. How nice to have your own personal bread baker! His fougasse looks lovely! I used 1/2 bread flour in this one - I like the "chew" that it adds to flatbreads like this. And I totally agree that bread is great for stress relieving (as long as you don't eat it all - that just adds new stress). Very true... you don't want to develop a dough belly from too much bread. Yes, we will definitely use the bread flour in the future with this loaf. I thought about using bread flour for this too and I think I will next time. Tell Trip his fougasse looks great! Oh, how wonderful that your husband stepped in and made this one, Diane! :) I am hoping my husband will want to do that some time. His bread looks terrific. I bet the bread stone does make a difference. Glad you all enjoyed this one. Yes, I'm pretty spoiled... but oh the carbs. Next week the baker of the family will make the tart. Diane, Will you ask Trip - is a pizza stone and a bread stone one and the same. I just purchased an Emile Henri pizza stone and, perhaps, that would do the trick. I also have always put a pan of water into my oven as I baked my baguettes. But, that was a ten years ago and I completely forgot about that technique. In a word, I tripped up! I loved seeing the pix of your husband and am glad you had a helper this week. They are interchangeable we used the stone for both pizza and bread. I love eating bread but I don't love making it. I loved how this bread recipe could easily fit into a busy schedule. Being able to chill it for several days and have it on hand, ready-to-bake, really livened up my meals this week. You are lucky to have a personal bread baker at your house! Hope you get those homemade bagels tomorrow morning. I am very spoiled in the baked goods department... though I have to keep him at bay. All those carbos can really add up. See you next week. I actually used the oil the olives were cured in to brusht he top of the dough, which I thought would give it some color, but it didn't - which is ok too... did you use black olives and get a purplish hue? Yes, we used black olives that were cured in oil. If you really want the purple color kneed the olives in well and they will bleed. Did you chop them? That will make them bleed more. Thanks for the tips on the baking stone and water pan in the oven. I will make a note on the page in the cookbook. Looks terrific! You are very welcome. It does make a big difference.